As Eric Voegelin said, the classical liberals were people who thought they could destroy a civilization just a bit, and then halt the process of destruction whenever they wanted it to halt. But Nietzsche saw much more clearly than they did: "The moral and social order to which the religion gave rise cannot survive its disappearance." As we continue our descent into societal chaos, today's progressive liberals will surely be shocked by and completely unprepared to deal with the convulsions that ensue, and will never, ever connect it to their own continued efforts to hack away at our civilization's foundations. The alarmist tone of this post is not something I'd expect from someone as sober as you. Where is the "societal chaos"? Where are the "convulsions"? What is the "destruction"? In what way is there is less civilization than before? I'm am just soberly watching us descend into chaos, Prateek! There is no point being "alarmist" about it, since nothing is going to stop it. See: Orlando, Yemen, Sandy Hook, riots at Trump rallies, Libya, Detroit, a million abortions a year, rural meth addiction, 25 years of bombing Iraq... and this is only the first stage of the disease! "In what way is there is less civilization than before?" I don't think "civilization" is a quantity. Europe is ahead of the US here: the birth rates have fallen to under 1.5 per couple in many countries. This is a civilization that has literally abandoned the future and is just winding things down gradually. I don't see how Europe is dying. I just explained it. Was there something unclear in what I said? Gene, your grasp on history is much superior to mine, and you know better than me that the English used to have civil wars that killed people in tens of thousands and lasted decades. American senators and Congressmen used to challenge each other to duels and engage in gunfights. Lynching and killing people for arbitrary causes was also common in late medieval England and then early years of United States. We are in one of the most peaceful periods in mankind history. As for falling birth rates, Saudi Arabia and Iran have seen birth rates plummet more than America or Europe have in the last 3 decades. Those are the most religious countries in the world. Would you say they have abandoned their spiritual foundation? Prateek wins this round. Compared to the past, today is great. People are more free than before, too. Prateek's example of Iran and Saudi Arabia, which I haven't verified, sounds damning if true. "I just explained it. Was there something unclear in what I said?" Yes, Gene. I do not see how having a low birth is synonymous with death. I'd wager the measure should not be bloodshed and violence, but the coherence and telos of the civilization. Is this what you think Gene? "Yes, Gene. I do not see how having a low birth is synonymous with death." Samson, what would biologist think about the future of a species in which every generation is only 60% the size of the previous one? "Endangered species list"? Have you read law and revolution by berman? Excellent systematic review of the same issue. No -- I will look. Civilizations evolve. Religions evolve. They must. "Evolve" is just a metaphor here. But yes, change is constant in all contingent being. When I am driving smoothly down the highway, I am changing. When I am driving off of a cliff, I am also changing. While both are change, there are important differences. As for mass murder of children in Sandy Hook, in the very atheist Soviet Union or Communist China, we did not see young men taking to murdering a large number of children. Those were countries that have arguably abandoned their spiritual foundations more than America has. Although mass murder of children is surprisingly common in many parts of Middle East and Africa, regions with the strongest "spiritual foundations" in the world. 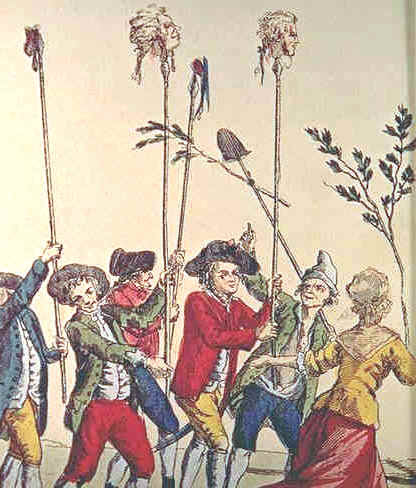 I think the only problem with the French Revolution was that it got a little bit out of hand. Okay, fine! It got way out of hand. But it embodied Enlightenment ideals in the beginning. The French Republicans were able to implement a representative assembly before they went psycho. "But it embodied Enlightenment ideals in the beginning." Which is precisely the problem!! "Which is precisely the problem!" I thought it was the zealotry the revolutionaries exhibited that was the problem. "Which is precisely the problem!!" It wasn't the chopping off of heads? Which followed closely upon the Enlightenment principles. "For the Philosophical Conservatives the greatest crimes of the Revolution in France were those committed not against individuals but against institutions, groups, and persona statuses. These philosophers saw in the Terror no merely fortuitous consequence of war and tyrannic ambition but the inevitable culmination of ideas contained in the rationalistic individualism of the Enlightenment." I.e., "Prateek confirms my bias." "Compared to the past, today is great." You would no doubt be puzzled by the myriad of quotes praising the USSR in the 1930s or China in the 1950s as ushering in a new dawn for humanity. In 100 years, people will be asking, "How in the world could anyone in the US in 2016 have thought 'everything is great'?" Maybe or maybe not. The people proclaiming that, though, liked what was happening. "Gene, your grasp on history is much superior to mine..."
And therefore my grasp of whether a civilization is collapsing is as well? I think it is possible for someone to have the right information, but not necessarily draw the right conclusion. You have made a similar point about Dawkins and the Selfish Gene. The book may be right on the detais of evolutionary biology, but then he seems to spread his conclusion about the nature of the gene to views on society as well. But anyway, considering that even the most religious societies in the world are having falling birth rates. So falling birth rates can not have to do something with "spiritual foundations". Iran, after all, did not suddenly become atheist with its fertility rate of c. 1.5. "But anyway, considering that even the most religious societies in the world are having falling birth rates. So falling birth rates can not have to do something with 'spiritual foundations.'" Even non-smokers get lung cancer. So lung cancer cannot have anything to do with smoking!! What do you expect me to do with reasoning like this, Prateek? I hardly doubt Iran turned atheist. Their fall in birth rates was heavier than that of any Western country. Prateek: "A non-atheistic country has a low birth rate. Therefore low birth rates can't possibly be connected to lack of religiousity." Gene: "By analogy, some non-smokers have gotten lung cancer. Therefore, you must believe smoking is totally unrelated to lung cancer?" "Iran experiencing tsunami of atheism"
Prateek and Samson are right -- people aren't 'dying off' they're evolving. Some people are having children -- religious conservatives -- and others are not, and voluntarily choosing to die off -- areligious liberals. Conservatives are wrong about the Enlightenment -- it was the best thing to ever happen to them. "…and others are not, and voluntarily choosing to die off…"
Scott, I understand you have a libertarian background and this is something I see a lot of libertarians do. Why say "voluntarily choose" instead of just "choose"? Is the adverb necessary? "Conservatives are wrong about the Enlightenment -- it was the best thing to ever happen to them." Well, slavery before the Enlightenment was actually a lot more humane than slavery during it. I'm not sure why I put in the 'voluntarily'. Probably because I had the Enlightenment on my mind, which emphasizes the 'voluntariness' of free choice, which in this case is being put to a use which isn't particularly conducive to the extension of the movement... I guess I did it to highlight the irony. Also, my background is only sort-of libertarian -- I think fundamentally, viscerally, I'm pretty red-tribe. It is economic theory that pulled me into libertarianism. But hasn't this conversation played out on this blog before?